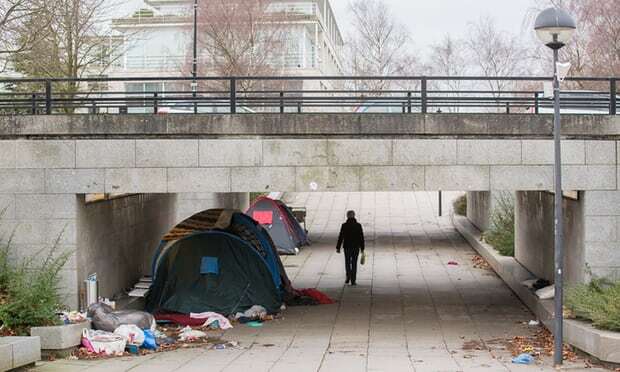 The number of people sleeping rough in UK has risen 169% since 2010. The NHS, education and all manner of council services are all in crisis due to chronic underfunding. As the public sphere collapses, excessively rich individuals take an ever greater share of the wealth. 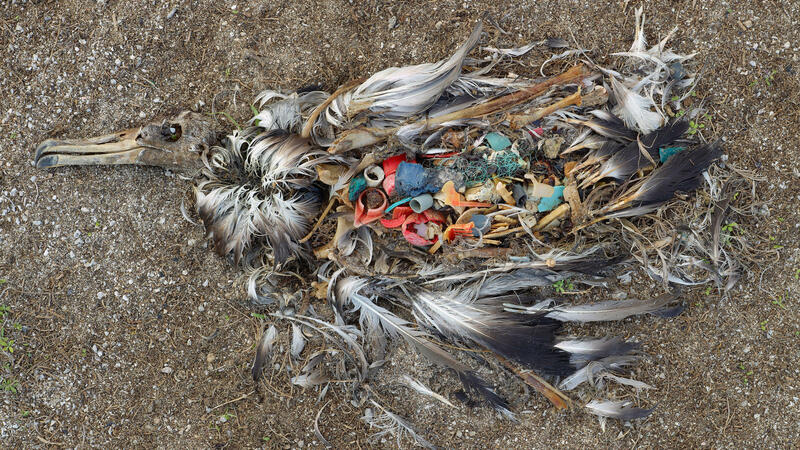 Meanwhile the natural world is being trashed at an unprecedented rate. Globally pollution now kills three times as many people as Aids, malaria and tuberculosis combined. As I said in a blog in October ‘We need a pollution minimizing way of maximizing the benefits of a modern global economy that can bring prosperity to all humans while allowing biodiversity to flourish.’ That socially inclusive and ecologically sustainable goal can be achieved. The technological options are already available. The missing ingredient has been political will. Since the Thatcherite revolution of 1979 there has been a quasi religious belief in market forces and low taxes. It is time to challenge this. Now might be the time to bring back big government, but in a radically reinvigorated manner. I would like to see the top rates of income tax raised to 100%, top rates of stamp duty and death duties increased, tax loopholes and tax havens closed. Corporation tax should be increased. The basic rate of income tax could also be raised by a few pence. Taxes on all forms of pollution should be set in order to force whole industries out of existence. All forms of advertising should be heavily taxed. Also many areas of government funding should be cut, from subsidies that promote unsustainable farming practices to oil and gas exploration. Many costly projects such as Trident, Hinkley C and HS2 could all be abandoned. With this vastly increased revenue a lot of vitally important work should be done. A universal citizen’s income could be introduced. Funding for the NHS and education should probably be doubled. Political power needs decentralizing. Local government funding could be increased perhaps fourfold and many new responsibilities could be transferred from national to local government. Funding for socially and ecologically innovative projects would be available. The conservative party once had a reputation for sound financial management, yet the national debt has massively increased under this incompetent Tory government. I think we could quickly reduce the national debt while creating a paradigm shift towards a socially fair and ecologically sustainable future. The health, education and wellbeing of people now and in the future needs investing in, and to do that we need to raise a lot more taxes. This entry was posted in Economics, Politics on 29 January 2018 by Richard. Theresa May has declared a ‘war on plastic’, however with the weak and distant goal to ‘eliminate all avoidable plastic waste’ within 25 years. It is another example of politicians claiming to lead while offering too little, too late. There is so much more that we could and should be doing, at all levels, from individual consumers through corporates to councils, national governments and up to the EU and UN. Many individuals around the world are trying to make changes in their own lives to reduce pollution through our own lifestyle choices and in how we engage as citizens. For decades we’ve supported campaigning groups like Friends of the Earth and Greenpeace, and voted for the few politicians who seem to take these issues seriously. One of my favourite new initiatives is City to Sea, a grassroots consumer campaign set up by the singer Natalie Fee. Do watch her TED X talk: inspiring stuff! As Hugh Fearnley-Whittingstall shows, corporates can take a lead. He praises the supermarket chain Iceland who have committed to a five year timescale to reduce their use of plastic wrapping, so highlighting the slothful 25 year ambition of Theresa May. One of the biggest ideas is the switch from sale to lease. So Riversimple are a car company that plan never to sell a car, but to lease them, thus reversing the economic pressure to build obsolescence into the product. Can we imagine clothes, toothbrushes and children’s toys which were all designed to be leased and endlessly reused and/or recycled rather than being sold and thrown away? This entry was posted in Environmental on 23 January 2018 by Richard. The number of solar panels in use will keep growing for decades. Some will be on trains, ships, planes and integral with road surfaces. Probably most will be installed on rooftops and in deserts where they are not in competition with other land uses. A lot will be on farmland, where they can detract from agricultural production. Currently in the UK they tend to combine solar and livestock, often with the added goal of increasing biodiversity. Another possibility is to grow fruit, vegetables or arable crops in association with the panels. 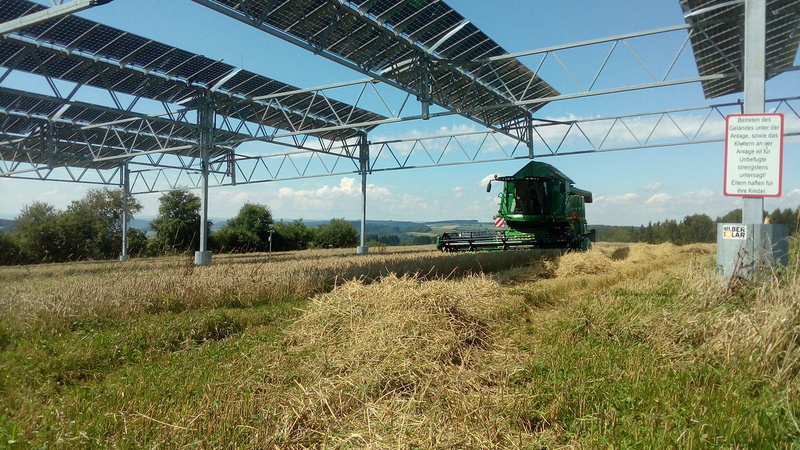 The Fraunhofer Institute have been running a trial on a third of a hectare plot at Heggelbach near Lake Constance, growing a variety of crops under the solar panels. The panels are more widely spaced than usual to allow sufficient light to reach the crops, and high enough for a combine harvester to work under them. The combined solar and agricultural productivity of the land should allow increased income for farmers. Other trials have taken place in USA, India and Japan. The Japanese project is growing 40 tons of cloud-ear mushrooms per year under a 4MW solar installation, which I would think must be one of the most productive dual uses of land anywhere and produce a good income for the farmer. It seems to me that the best place to combine solar panels and agriculture is in the hot arid tropics where the shading is likely to help plant growth and reduce transpiration. The vegetation may also help keep the panels from overheating and so aid the efficiency of the solar panels. Doing a web search I’ve only come across a couple of small trial projects in India and USA. I’m sure other projects exist. They ought to. The potential benefits are huge. I would really like to see a large scale project doing both electricity and food production at a commercial scale, and doing proper scientific evaluation. The solar power might in part be used to drive irrigation, perhaps from solar desalinated seawater. The steel structure supporting the solar panels could also be used to hang shade netting, horticultural fleece or be integral to glass or plastic greenhouses, all of which could help increase crop production while reducing water use. Pioneering projects that I’ve blogged about in Somalia and Jordan could be expanded to incorporate solar panels directly over cropping areas. I think this may be one of the most beneficial technological combinations in the fight for food, energy and climate security. If anyone reading this blog knows of such projects perhaps they would send me a link. Thanks. This entry was posted in Energy, Environmental, Food & Farming on 13 January 2018 by Richard. Coal Collapses and Renewables Rise. 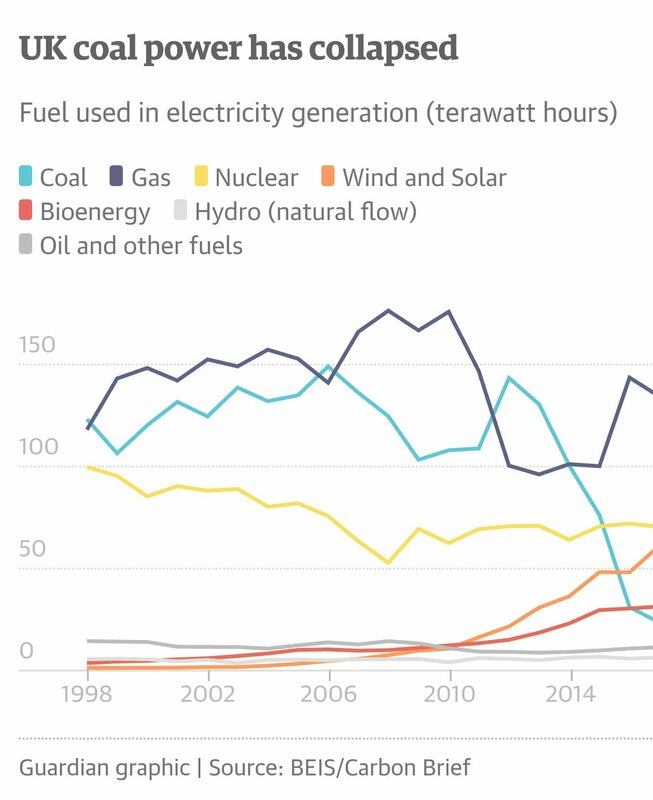 This graph of UK electricity; part of a global trend. At this time each year on this blog I like to highlight something that has helped in the process to make a more ecologically sustainable, socially just and peaceful future possible. Sometimes I focus on a political leader who has made an outstanding contribution, sometimes on a particular innovative clean energy technology. This year I want to celebrate a whole global trend, the switch from fossil fuels to renewables, and especially the growth of North Sea wind. Ever since I started blogging I’ve been saying humanity should switch to 100% renewables, for electricity, heating, cooling and transport. We can then simultaneously ditch fossil fuels and nuclear. The speed with which renewable technologies are progressing is staggering. Performance is improving while costs keep tumbling. The ecological case for moving from ‘The Fossil Fuel Age’ to ‘The Solar Age’ always was strong, now it is the most economically sensible thing to do. In 2017 the first contract has been signed which will see an offshore wind farm built without subsidies. The German electrical utility EnBW submitted a bid of Euro 0.00 in a competitive tendering process to build the 900 MW He Dreiht windfarm in the North Sea. As solar and wind energy get cheaper the case for greater international grid integration gets stronger. The Dutch grid operator TenneT has proposed building an artificial island on the Dogger Bank and linking all the electrical grids of the countries surrounding the North Sea together in a hub and spoke arrangement. Electricity could then be sent to wherever in Europe it was needed. I’ve blogged before about this, but now support seems to growing and it is projected to be in operation by about 2027. TenneT estimates that 30GW of windfarms might connect to the first hub, and that other hubs might also be built. This would be a huge step forward in reducing carbon emissions and pollution in general across much of Europe. All over the world innumerable renewable energy projects are demonstrating that we can provide electricity, heating, cooling and transport to all 7.6 billion of us while tackling climate change and achieving all the other global goals. Over the coming year I’ll highlight more of the technologies and politicians that are showing the path to a better future. This entry was posted in Climate Change, Energy on 7 January 2018 by Richard.